Originally, Toolman and I were going for some dosas for lunch today. We headed over to the Dosa Grill and... it's closed! WTH? This is like the 3rd time for me with this place. The operating hours clearly state it should be open. This is one of the most annoying attributes a restaurant can have. I have very little patience for a place that decides on their operating hours on a whim. Usually, I just give up on those places no matter how good the food is. Poco Ocean in Coquitlam is a prime example. Although the food is good, you have to roll the dice when it comes to being open. 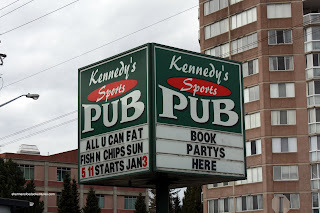 So without a place to go, we settled on Kennedy Sports Pub. Yah, I know, a pub is not necessarily a foodie haven. But, we were short on time and there are pubs that can produce some pretty good eats to go with the booze. 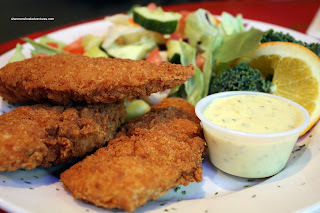 As with many establishments of this genre, the food can be pretty standard. After all, much of it is supplied by Sysco. Of course raw materials and execution are 2 mutually exclusive things. 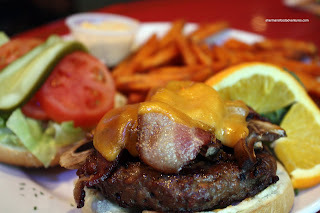 I did the pub food thing and went for a Canuck Burger that was topped off by mushrooms, bacon and cheddar. You know what? It was a typical pub burger. Although, there were lotsa fresh veggies and the patty was cooked just right, not being too dry. I added yam fries and those too were quite decent. Toolman was even more adventurous and ordered Chicken Strips. Yah, I know I'm being sarcastic here. Well, once again, the strips were fried nicely while the meat still being tender. Yup, pretty generic food; but it was prepared right. Not expensive either. It won't set the gastronomical world on fire; yet it did the job. Not too sure about the pub itself, it's looking a little tired. Probably time for a makeover. sheesh... this place isn't so popular on urbanspoon, is it? i think this is the type of place that gets a bad reputation because of unrealistic expectations. it's pub food and sometimes it's what we all need. it doesn't look bad at all - i'd go for those yam fries. You're right Trisha, it's a pub... no more, no less.